The April Art Walk will be held May 5th from 5:00 to 8:00 pm at the shops and galleries on Public Square, Franklin Street, and Strawberry Alley. The participating businesses are listed below as well as a description of the work they will be exhibiting and services they will be offering during the event. Edward’s Steakhouse is proud to feature local artist, Jane Olson, during the May First Thursday Art Walk. Jane’s art brings a fresh approach to watercolor pieces in a variety of sizes. Some of her favorite subjects are waterscapes, landscapes and floral compositions in the impressionistic and abstract styles. Stop in, see the art, listen to Jackson Miller, live, on the piano and enjoy Cinco de Mayo with the Thursday night special, 1/2 priced $7.00 appetizers and 2 for 1 draft drink specials. The Roxy Regional Theatre’s Peg Harvill Gallery is proud to feature the art of local artist, Miranda Herrick, during the May First Thursday Art Walk in conjunction with the current production of Green Day’s AMERICAN IDIOT. Due to a performance that evening, the gallery will only be open from 5pm to 6:30pm. For tickets to and information about our current production, Green Day’s AMERICAN IDIOT, please visit www.roxyregionaltheatre.org or call the box office at 931.645.7699. Stuart Bonnington returns to the College Coffee Co. performing songs from the British Invasion from 6-8pm during the May First Thursday Art Walk. Downtown Artists Co-op (DAC) is proud to announce ‘Wanderings’, an exhibit by member artists Leah Foote and Connie Livingston-Dunn. Glenda Rohner will also exhibit an installation art piece named “influence” in DAC’s window galleries this month. The opening reception will be on Thursday, May 5th from 5PM till 8 PM. “Wanderings” and “influence” will be on display through May 28th. Leah and Connie titled their show Wanderings because that word fits so perfectly with their styles of art. Both find that, similar to the exploration of new locales and settings, their journeys in art are explorations of new subjects and techniques. Connie’s fanciful realizations range from her digital fractal imaging to exploring different media and the use of the unusual combined with more traditional materials. In the same vein, Leah’s subject matter reveals whatever catches her interest at the moment from collage abstracts to her newly discovered love of painting en plein aire. Connie is fond of the Japanese term “wabi-sabi” meaning the acceptance of imperfection, and transience. They both feel their art fits this description. Art will never be perfect, nor should it remain static, but should always be changing. Connie Livingston-Dunn has been experimenting with new directions in mixed media and digital art. Her wanderings have meandered through mixed media collages on watercolor paper, alcohol inks on collaged backgrounds, cold wax and oil paint with stamped and printed papers, and to textured surfaces on canvas and fiberboard with objects arranged to tell a story. She has taken some of her artworks, imported photos of them into her fractal program and spun them into new fractal visions. She likes viewers to unravel the stories, symbols and unspoken poetry within the artworks to experience an altered point of view and new way of seeing. Some of her artworks and photographs are used as illustrations for stories and poetry that she writes on cowbird.com. As a retired art therapist, she has recently begun a new phase in her art journaling process with a variety of media. Leah has been seriously devoting time to art since she retired from a career in education in 2007. She began her college career as an art major but soon was drawn to English and later elementary education. She graduated from Mississippi State College for Women (now Mississippi University for Women). After she and her husband moved to Clarksville in 1970, she added additional education endorsements and earned a Masters Degree from Austin Peay State University. Upon retiring, Leah returned to her love of watercolor and took watercolor lessons from Gail McDaniel for several years and has taken classes from Gayle Levee trying to apply watercolor techniques to her classes in oils. She has continued painting with groups of friends and attending workshops to learn from artists she admires, including Iain Stewart and Karlin Holman, with the goal of learning to adapt parts of what they do to her own style. She recently joined the Chestnut Society and has discovered the joy of the immediacy of painting on location and from life. Her current focus is trying to apply the freshness of plein aire painting to her studio work. Leah is a member of the Downtown Artists Co-op in Clarksville, the Tennessee Watercolor Society, and the 2 Rivers Society of Painters. The DAC will be serving up fabulous appetizers, punch and wine during the opening reception. 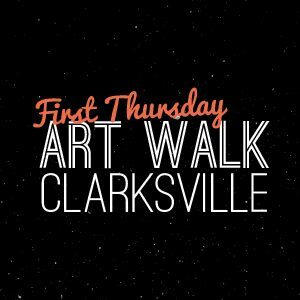 As always, the DAC opening is a central part of Clarksville’s First Thursday Art Walk, a wonderful evening of art, music and more in beautiful Historic Downtown Clarksville. First Thursday Art Walk occurs regularly on the first Thursday of each month. Current exhibits will be on display the entire month of May. The DAC Gallery is located at 96 Franklin Street, in Downtown Clarksville, TN. DAC will be open Noon-4pm, Wed.- Fri. and 10am-6pm on Sat. See our website at www.downtownartistsco-op.com or visit us on Facebook for more information. DAC thanks Dee Boaz, Dr. John Letty, The Framemaker and Sango Fine Wines & Sprits for sponsoring this month’s exhibit. Join us for the May First Thursday Art Walk and enjoy free admission! A celebration of Mississippi’s rich musical heritage, the exhibition A Cast of Blues features 15 resin-cast masks of blues legends created by artist Sharon McConnell-Dickerson, as well as 15 color photographs of performers and of juke joints by acclaimed photographer Ken Murphy. Tennessee artist Carol LeBaron transforms remembered light to imagery, collecting fragments from both the landscape of her remembered experience and observation of natural forms. Artist Lauren Brady uses layers of transparency and texture in her landscape paintings, exploring the development that occurs with time and what is seen in retrospect. This gathering of paintings by William Stamms Schackelford showcases his unique depictions of various people, including portraits of the Clarksville Shackelford family. Sponsored in part by Tennessee State Museum, Austin Peay Department of Art & Design. Couture Crush is proud to support the May First Thursday Art Walk and will stay open late that evening. Find some new additions for your Summer wardrobe during the May First Thursday Art Walk! Chad Malone is a Graphic Designer and Illustrator who works primarily with digital illustration living in Nashville, Tennessee. He earned a Bachelor of Fine Arts degree in Graphic Design from Austin Peay State University in 2013. Malone is best known for his work with 20th Century Fox’s hit sitcom Arrested Development. In the same vein as his winning illustration for the cover of the sitcom’s fourth season, his exhibit Name That Show! features illustrations of characters from various television genres. Rogate’s Boutique will not feature an artist during the May First Thursday Art Walk, but will be open for business until 7pm. Stop in an find a a few new pieces to welcome Summer into your wardrobe! Hops Road, located on Strawberry Alley in Historic Downtown Clarksville, is proud to support the May First Thursday Art Walk. Stop in and enjoy the artwork displayed throughout the shop, pick up locally sourced products and food and grab a cup of coffee as you enjoy the May First Thursday Art Walk! Mildred and Mable’s will stay open late during the May First Thursday Art Walk.